Most survey reports in the media these days give you the overall results, followed by something like “but, in these divided times, there’s a split by partisanship.” But at JUST Capital, we’ve found that people of all types – liberal, conservative, high-income, low-income, men, women, millennials, and boomers – think workers’ issues are the most important aspect of justness in corporate America, and that businesses should share more of their success with workers rather than focusing primarily on shareholders. 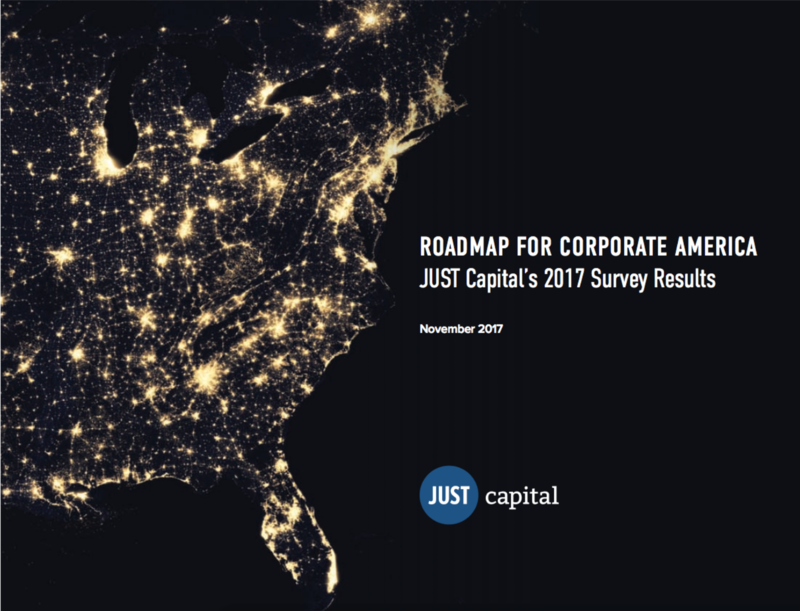 JUST Capital’s latest report, “A Roadmap for Corporate America,” outlines the findings from our 2017 survey work. We surveyed representative samples of more than 10,000 Americans in three surveys conducted in partnership with NORC at the University of Chicago, building on our work over the last three years that includes the opinions of more than 72,000 Americans. The overall trends don’t paint a pretty picture for companies. 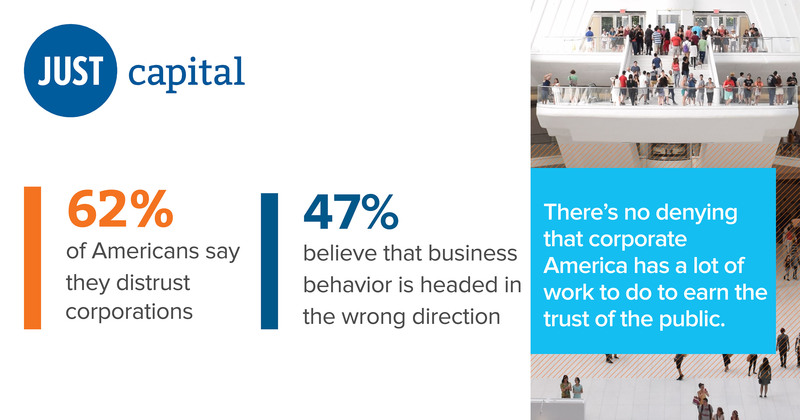 A majority of Americans (62 percent) say they distrust corporations, and nearly half (47 percent) believe that business behavior is headed in the wrong direction, compared to only 27 percent who think companies’ behavior is on the right track. Even among Republicans, who are typically pro-business, the same number think companies are going in the wrong direction (39 percent) as think they’re on a positive trajectory (39 percent). Nearly 7 in 10 Americans think companies’ top priority is their shareholders when asked to choose between that group, customers, and their workers. 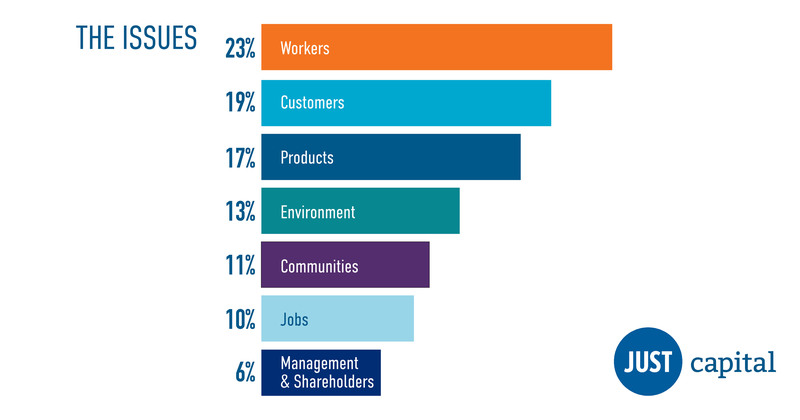 Only 9 percent say companies care most about their workers. Consequently, Americans overwhelmingly say that companies do not share enough of their success with their workers. There are no substantial deviations from these numbers among any demographic subgroup. In order to give companies direction on what Americans do want from them, over the past 3 years we’ve asked Americans in focus groups and surveys what actions companies can take to be “just.” Our top 7 issue areas emerged directly from that work: Americans want companies to care about their workers, their customers, the communities they interact with (both in the U.S. and abroad), their management and shareholders, create jobs, and make quality products. There are many elements that go into being “just” in these areas, but the roadmap to being a just company is clearly focused on these themes — with putting workers first as the top priority. In the eyes of the public, one-third of a company’s justness derives from the way it treats its employees (23 percent from worker-related issues and an additional 10 percent from job creation), and only 6 percent stems from the way a company addresses shareholder and management issues. There are lots of ways a company can prioritize workers, but the most important elements are related to pay and compensation. Paying a living wage and paying a fair wage for the job and industry are the top issues. Liberals and moderates place top importance on paying a living wage, while conservatives give that top spot to paying a fair wage. Across every demographic category, pay issues are the top concern. Beyond pay-related issues, Americans want to see employers provide a safe workplace, offer benefits such as health insurance and paid time off, and prevent discrimination in their personnel decisions. Taken together, these priorities create our “A Roadmap for Corporate America.” To create a more just version of capitalism, companies must rebalance their priorities and improve the conditions experienced by average workers. To learn more about all the findings of our 2017 surveys, we invite you to read our full report, which includes breakdowns by different demographics, from age to gender to partisanship, for how Americans believe companies should arrange their priorities when it comes to worker-related issues. Additionally, these survey results provide the foundation for the annual JUST Capital rankings, which rank companies in the Russell 1000 head-to-head on the issues Americans care about most. These rankings, including the list of America’s Most JUST Companies and the groundbreaking JUST 100, will be released on December 12, 2017. Stay tuned for updates on our upcoming release and additional research insights to come.